We provide a fantastic product/service, yet we just aren’t achieving the levels I know we can achieve and our competition, whose product/service isn’t as good as ours, is doing great. Why isn’t my business performing as well as I know it can? Is our business strategy really the right one? It just doesn’t seem to be getting the results we expected or hoped for. Why do we lose sales that we should clearly be winning? How do we create more (new) revenue for our business? How can we increase our revenues from our existing customer base? My employees/staff just don’t seem to be very motivated. How do I best address that? These are among the many questions that today’s business leaders have on their minds. These and similar questions are often what prompt them to seek out a business advisor. 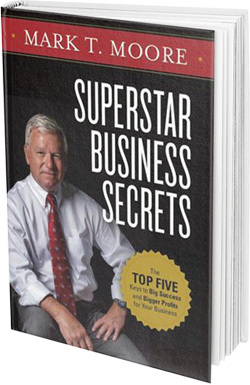 Mark T. Moore, the founder of Sales KnowHow and author of Superstar Business Secrets: The Top Five Keys to Big Success and Bigger Profits for Your Business, can help you answer these questions and put you on the path to creating a Superstar Business. You might still be unclear about the role of a business mentor or advisor. An advisor is someone who helps you move your business forward. Whether he or she is focusing on your ideas, specific projects, troubleshooting, or giving advice along the way, an advisor can do a lot for you. So what could a business advisor tell you about how to improve your business? Author, speaker, mentor and consultant Mark has a few ideas. You’re in business because you’re passionate about what you’re bringing to the world. But what can you do to make that mission go further? What do improvement and success mean to you? A business advisor can help you come up with concrete ways to approach these areas. Whether you want to reduce costs, improve marketing, get more sales leads, or just improve yourself as a leader, an advisor with the substantial international experience that Mark has can help you articulate those goals and make them reality. Not everyone needs the same sales pitch. Not everyone even needs a sales pitch. It can be tempting to spread the word as far and wide as you can, but that’s not the most efficient use of your businesses energy or resources. Know your audience, where they are, and what their needs are. Give these customers or potential customers the time and personalized attention that they deserve, and you’ll be rewarded with their loyalty and their continued contracts. Chances are you’re already aware of what your limits are which may mean that you’re considering the benefits of a worthy and proven business advisor. A business mentor of Mark’s caliber can help you turn your weaknesses into strengths and grow yourself as the leader you know you can—and want to be. The fact is you know that for your people to be the best they can be you need to be the best you can be. Whether it means delegating, outsourcing, or pinpointing best practices, Mark can guide you to that place where you can lead with total confidence. The world is changing, and with it the world of business. With new technologies coming out almost every day and the way people work shifting seemingly overnight, it pays to know what’s going on in your industry to avoid stagnation. It can seem overwhelming, but a business advisor can help you make the best decisions to your greatest advantage. Your responsibility to yourself and to your business is to continually grow yourself beyond who you currently are in order to become the person and the leader you can be. These are just a few of the tips that a business advisor might tell you. When you hire one, an engaging, passionate and experienced person will serve you best. Mark and his 30 years of business experience between his sales career, the founding of Sales KnowHow, and his book Superstar Business Secrets, has a wealth of knowledge to share. As a dedicated, successful entrepreneur, you deserve great things: let Mark help you get there. He’d love nothing more than helping you succeed!